So you’re planning to build a website. Is it for your business? For sharing your thoughts and ideas? For showcasing your portfolio? No matter the type of website you wish to create, you need a reliable web hosting provider to get you on the right track. But how can you find the right one in the vast sea of web hosts promising you with “the best service you’ll ever experience” and “the cheapest price you’ll ever get”? Everything has something awesome to offer, so how do you even begin to decide if a web host is good? Is it the price? Is it the unlimited disk space and bandwidth? Does the 24/7 customer support even matter these days? Like most other things, deciding which web host to choose can be pretty tough. There has to be a way to cut through all the technobabble and separate the web hosting wheat from the chaff! Web hosts like BlueHost and iPage are top choices among startups and small business owners but if you’re looking for the middle ground between basic and robust web hosting services, then iPower might just be your answer. What is iPower Web Hosting? iPower is one of the better known web hosting providers that offer a wide range of affordable hosting packages. They have been in business since 2001, with a commitment to providing quality service to their clients. Since then, they have experienced rapid growth, hosting more than 700,000 client websites from over 100 countries across the globe. This alone speaks volumes in terms of their popularity, which is one of the reasons iPower is a top choice among website owners and web developers. But let’s not talk quantity – let’s focus on quality! 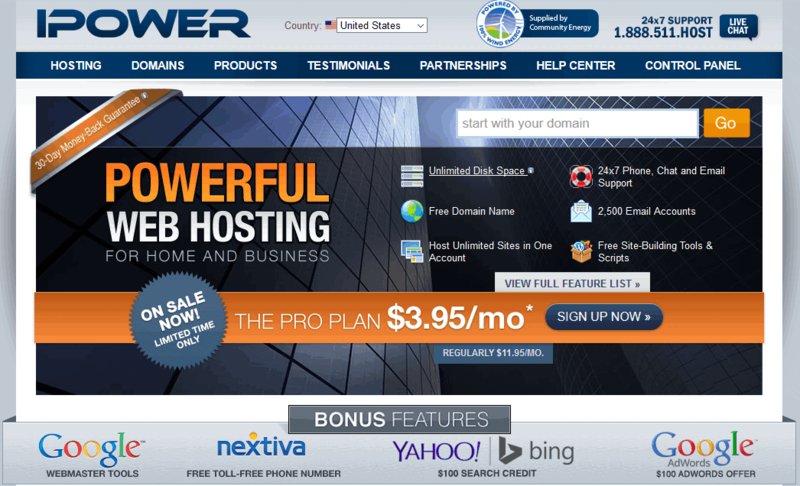 Why is it that a lot of people are turning to iPower for their hosting needs? Well, that’s exactly what we’re going to talk about in this in-depth iPower web hosting review. My aim here is to help you make the right decision by introducing you to iPower’s reputation in the web hosting community, the price for their hosting plans, the features that come with each of their plans, their uptime record, customer support, and everything in-between. Yes, I’m going to cover everything you need to know about this web host – both good and bad – so you can verify whether or not this web host can satisfy your specific needs. Without further ado, let’s get down to the nitty-gritty details! iPower offers a range of web hosting plans, including 3 shared Linux-based hosting plans, VPS hosting, dedicated server hosting, as well as a not-so-common Windows hosting plan. The Linux OS continues to dominate the web hosting scene, but some web developers and site owners prefer to build their websites on a Windows-based server. Not all web hosts offer Windows hosting, so the availability of this particular type of web hosting on iPower is a big plus for me. Like most web hosts, iPower offers cheap shared hosting plans that come packed with just the right features. You can choose from three tiers: Starter Plan, Pro Plan, and Pro Plus Plan. Like other web hosts, iPower offer low introductory rates to new customers. At the time of writing, they’re offering a limited-time special introductory price for their Pro plan. If you sign up today, you can get this shared hosting plan for only $3.95 a month (regularly $11.95 a month). That’s a whole lot of savings, so you better hurry now before the sale ends! What’s more, you have the option to pay on a monthly basis for all of their plans. This is great news for those who don’t want to be tied down to a web host for more than a year. But if you like what you see and you really want to save money, you should consider committing to a year or more. iPower’s basic Starter Plan is currently at $3.99 per month, which includes 5 GB worth of disk space, 250 GB bandwidth, plus one email account and one domain. If you sign up for one year or more, the monthly fee will be the same, although domain registration is added into the package for FREE. If you go for the month-to-month plan, however, you’ll have to pay an extra $8.99 at signup. The higher plans, Pro (currently at $3.95 per month) and Pro Plus (starting at $11/99 per month), both offer unlimited bandwidth and disk space, as well as unlimited domains. The latter adds 3 free personalized domain names, plus unlimited email accounts. BlueHost is more generous in this regard as they offer unlimited email accounts on their higher tier shared hosting plans. For those looking to set up an eCommerce site, iPower will get you to a good start with $200 worth of ad and marketing credits: $100 Google AdWords Bonus + $100 Yahoo! Search Marketing Credit. This offer, however, is not uncommon among web hosts but iPower have added FREE YellowPages.com directory listing and FREE toll-free phone number (US only) – making their offer particularly attractive. My advice? You can get the best value out of iPower’s Pro plan but if you’re on a tight budget and are planning to launch a small website or blog, you can get away with the Starter plan. If you own an online store, however, it’s best to go for the more robust Pro Plus plan. iPower also offers VPS hosting packages for site owners who have outgrown shared hosting, and need more control and higher performance for their site. There are three tiers to choose from: Basic, Business, and Optimum. Pricing is from $24.99 to $79.99, depending on your chosen plan. Right now, however, a 20% promotional discount is available for all their VPS plans. So if you go for their Basic plan, you can get it for as low as $19.99 per month (regularly $24.99 per month). It’s quite an attractive deal, right? iPower’s VPS plan is ideal if you have a constantly growing site with dynamic content and/or eCommerce capabilities that require high performance and flexibility to adjust server resources as it expands. What’s more, it’s much cheaper than dedicated hosting (which we’re going to talk about later)! Each of iPower’s VPS plans includes a FREE domain registration, personalized email and advanced email tools, free advertising credits, and 24/7 customer support. What’s more, you can manage your site using the ever-popular cPanel control panel, so you’ll never have to worry about building your site from scratch (even if you’re new to this whole web development thing!). iPower has a pretty good deal here but BlueHost remains ahead of the game with their offerings. What’s more, they’re currently offering a juicy 50% discount on all their VPS plans! If that sounds appealing enough, make sure to visit BlueHost’s official homepage for more details. For rapidly expanding or thriving websites, you might need to invest on a dedicated server for the highest level of security, optimal performance, and rapid response times. iPower offer powerful dedicated servers, too. You can choose from three server configuration: Standard, Enhanced, and Premium. The price begins from as low as $149.99 per month to $239.99 per month, which is a pretty great deal considering how some other web hosts offer a dedicated server for as high as $600! And if you sign up today, iPower will top it up with a limited-time 20% discount. For instance, you can get the Premium plan for only $191.99 per month (regularly $239.99 per month) on your first term of service. It’s one of the cheapest offers you can find in the market! With a dedicated server, you’ll get your very own private server; independent control over server configuration; and the ultimate in speed, flexibility and performance. iPower also promise full assistance from their team of experts with 24/7 expert support. They’ve packed all the necessary features for you to run multiple high-traffic websites or an eCommerce site. And for optimum security and reliability, iPower use cloud-based technology for seamless migration options and instant provisioning of server resources. You also have plenty of room to grow and scale your site as demands increase. As you can see, iPower has a pretty great deal for you if you decide to go for a dedicated hosting plan. In fact, it’s just as good as BlueHost’s offer. But if you compare the price, BlueHost is cheaper by a few bucks, and that’s because they’re currently running a limited-time 50% discount on all their hosting plans. Besides offering the usual hosting packages, iPower also offer managed WordPress hosting plans for those who love to build websites on this ever-popular and powerful website-building platform. You can choose between WP Starter and WP Essential, both of which come at a very cheap price. The great thing about managed WordPress hosting is that the platform already comes pre-installed with the plan, so you no longer have to waste your time installing it yourself. What’s more, you have access to a whole plethora of free themes that are carefully handpicked by iPower to help you spazz up your site. Add to that some pre-installed WordPress plugins to help you expand your site’s functionality. From the all-in-one social powerhouse Jetpack to the server-boosting W3 Total Cache, iPower has got you covered! Want complete control over your WordPress site? With managed WordPress hosting, you’ll get your own customized control panel that’s designed for convenience. From the control panel, you’ll get quick and easy access to all the tools you use the most. Talk about built-in functionality and style! If you want the best value, you should definitely go for the WP Essential plan. You may have to pay an extra couple of bucks but if you want optimum speed and performance for your site, then it’s certainly a worthy investment. Not only will you get super speed and an integrated experience, you’ll also get a deluxe security suite to add an extra layer of protection for your site. You even have your very own personalized, expert support to guide you along the way! iPower boasts a versatile and user-friendly cPanel control panel that comes equipped with all the tools you’ll need to create a dynamic and highly engaging website for your customers and visitors. As you soon as you sign up for an account, you’ll immediately have access to a whole plethora of website-building tools in the “Website” section of the control panel, just waiting for you to get started. And you can do this with no prior HTML experience! From here, you can also review and analyze the traffic to your website, as well as edit files and check disk usage. 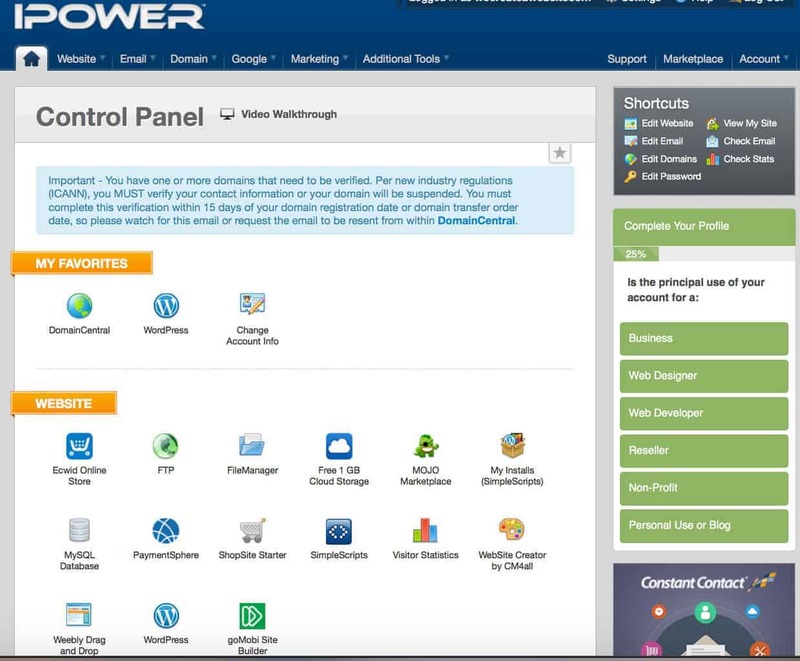 iPower even lets you customize the cPanel control panel by changing the layout to one that suits you best. You can choose from among four main settings and adjust dynamic “widgets” within these formats to include tools and key information you wish to see. Want to add more cool features to your site? Take advantage of the numerous web applications, including blogs, community forums, guestbooks, and many more. iPower have integrated simple tools for you to create a unique and dynamic website. What’s more, cPanel is where you can manage your MySQL databases, so you can start making magic! And of course, you’ll want to have all your account details at your fingertips, so iPower have devoted a whole section of the cPanel to contain all the necessary account information. Here, you can set up or change your security question, keep tabs of your payment schedule from the “Billing Console”, keep your credit card info up-to-date, change your password, etc. With a control panel as easy to use as cPanel, you don’t have to hire a professional or be a coding wizard to build a professional website! Running an online business shouldn’t be a difficult task, which is why iPower offer tools that make building an eCommerce site a breeze. Once you sign up, iPower will give you a ShopSite Starter online store for FREE so you can get your online business up and running the moment you log in to your control panel. Besides ShopSite, they also offer a wide array of FREE shopping cart software and many other handy eCommerce tools to meet your specific needs. Credit card processing. iPower provide PayPal payment services that allow you to easily and securely receive credit/debit card and bank account payments online. PayPal is one of the most trusted payment portals on the Web so you know you’re in safe hands. SSL Certificates. With a Positive SSL Certificate attached to your site, you can protect sensitive information during online transactions. And if you want iron-clad security, iPower also provide Extended Validation SSL Certificate so you can achieve the highest level of trust through the strictest standards of any SSL certificate. MOJO Marketplace. With the integrated MOJO Marketplace, you have access to thousands of applications to help you build, brand, and grow your eCommerce site. Doba. This popular dropshipping marketplace is ideal for wholesale suppliers and online retailers who want to connect their products and clients. iPower gives you access to more than a million products that you can sell on your site without having to worry about inventory. iPower promise to provide 99.9% uptime but based on various customer reviews, it seems that they still need improvement in this area. The average uptime record is 99.56%, which is a tad bit disappointing when compared to other top web hosts like BlueHost. This server issue also negatively affect the page-load speed, with an average of 2.5076 seconds (conducted at 13 different worldwide test locations). This is one of the slowest response times I’ve seen so far, which is a major concern for those who wish to sign up with iPower. iPower is committed to providing the best services to their customers. But any person looking for a trusted web host won’t rely on promises alone, which is why iPower gives potential clients a chance to try their offering without any risk. So go ahead and test the waters! Because if this web host doesn’t meet all of your needs, you can simply cancel your account within the first 30 days and they will refund your hosting fees. No questions asked. 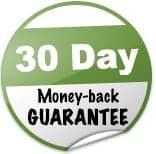 iPower’s industry-standard 30-day money-back guarantee applies to all their hosting plans, except for most add-on services, including domains. This means that, if you register a free domain through them, there will be a non-refundable $15 domain fee if you wish to keep your domain. You’ll be free to transfer it to a different host or simply point it elsewhere. If you want a longer trial period, consider checking out DreamHost since they offer a solid 97-day money-back guarantee – the longest on record! But if you really want value for money, go ahead and check out BlueHost’s Anytime Money-Back Guarantee. That’s right, you can still get your money back even if you cancel your hosting account after the 30-day trial period! This, however, doesn’t mean you could get your money back in full. BlueHost offers a prorated refund, which means they’ll deduct the fee for the months of the service you’ve used. That aside, an anytime money-back guarantee sounds like a good deal, don’t you think? iPower may have attractive hosting packages but there’s still room for improvement in terms of customer support. They provide 24/7 technical support via phone, email and live chat. First, I tested their phone support. I called and waited approximately 12 minutes before a representative answered my call. This is longer than the usual wait time I experienced in other web hosts, but it’s certainly not the worst. I just wished that iPower could offer hold-time approximations so their clients won’t be disappointed. I went ahead and asked the rep about the difference between shared hosting and WordPress hosting, and was quite pleased with the thorough answer. It proved that iPower hired the right people for the job, so no complaints here. Next, I tested live chat to get instructions on how to import an existing WordPress site. I had to provide personal information like my full name, email, domain, and answer to my security question before I could initiate a web chat. It took me about 5 minutes. I was satisfied with the rep’s response, and he even gave me a few links related to my questions. Besides the usual methods, iPower also have a large knowledgebase where you can find answers to commonly asked questions. There are also lots of user guides and video tutorials to help you out. The problem, however, is that some of the tutorials are a little outdated. For example, their guide for using the control panel needs to be updated since they are now offering a different type of control panel. Knowing these, you can now decide whether or not iPower is the right web host for you. But of course, it would be wise to first compare their service to other top brands like BlueHost, eHost, and iPage. This way, you won’t have to regret choosing a web host when there’s something much better in the market! iPower is a good mid-level web hosting provider that works just fine for basic hosting needs. I appreciate their easy-to-use control panel, as well as the availability of live chat support (which is important for emergency situations that require immediate help). Their hosting packages are good, although they fall behind in terms of customer support, server reliability, and speed. These are what prevent me from endorsing iPower to those who require a more robust hosting plan for building larger sites. That said, if you’re in need of a powerful hosting solution for a high-traffic site, it’s best to look elsewhere. Again, I hope this review can help you make the right decision in choosing a web host. Is iPower “The One” or would you rather look elsewhere for your hosting needs? Let me know what you think! iPower Goes Green! Now Entirely Wind Powered! Powerful Webhosting for Personal and Business.